Creating a username and password allows you to upload photographs, any accompanying data, as well as make comments on existing photographs uploaded by other users. Log on using your username and password and click "Upload photos" under the "My Info" tab on the toolbar. We will accept any photos in JPG format, however, those most useful from a scientific perspective will be those in focus and fairly zoomed-in and cropped tightly. 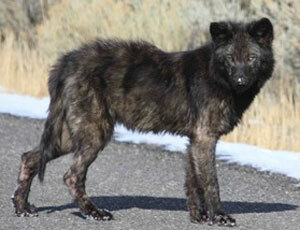 (Please be reminded that the legal distance for viewing/photographing wolves in Yellowstone is 100 yds!) We anticipate receiving all kinds of photographs, but examples of those that are particularly useful are in Figures 1 & 2 at the right. Once you have added and uploaded all your photographs, click on "Done uploadingEnter data". The data entry form (Figure 3) will pop up allowing you to enter accompanying data. 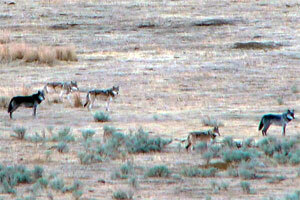 If you know the ID of the wolf or the pack you photographed, please select it from the "Wolf ID" and/or "Pack" dropdown menu. If the individual is uncollared but has a field nickname that does not appear on the ID list, please enter this and any other behavioral observations in the "Notes" section. The "Date," "Time," and "Location" are extremely important, and may be the only things that you are able to fill out. The location can be a description as basic as "Lamar Valley" or "Hayden Valley," but the more detailed locations such as "Lamar Valley, south of the Buffalo Ranch" or "Three miles south of Canyon Village" will be most helpful in allowing us to cross-check or assign packs and individual IDs. To enter the estimated latitude and longitude of where the wolf was seen, click on the green globe icon and drag the marker to the appropriate location on the map. Finally, select whether you would like the photo to be publicly available (if not, we use it strictly for research purposes) and whether you would mind if we used your photograph for educational purposes (public lectures, informational handouts, or scientific presentations/papers). Press "Save photo information." If you have multiple images taken at the same location, you will have the option to automatically copy the data onto the next photo's data form. You can then quickly edit the ID or notes section without having to re-enter the same location or pack data. It may take us a few days to cross-check and validate your photograph before it is publicly displayed (if you selected this option). 5) Scroll through posted photos and comment on them! 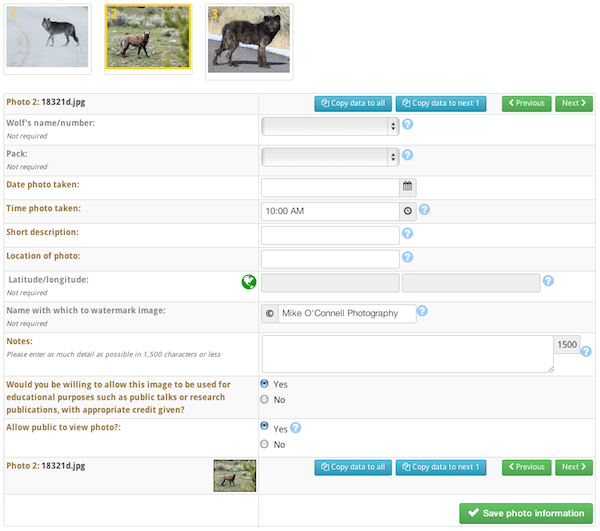 Once you have a user ID, you will be able to comment on existing photographs and help us with unknown IDs. This comment period will eventually close after a period of time has elapsed. 6) Compete to win our citizen scientist awards! We value your contribution and as an expression of that gratitude, we will offer regular awards for the "most photographs posted," "best photos of Interior wolves," and "best photos of mangy wolves," among others. Figure 3. An example of the data entry page.